work work work | Be Nice. What?! 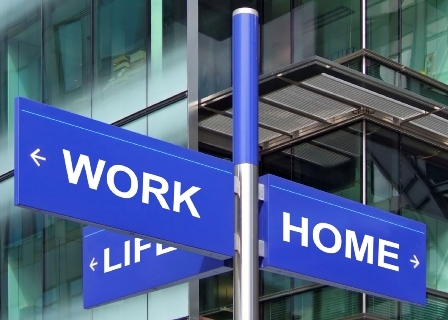 More time at work than at home? Forever? That really bummed me out. I mean, it isn’t depressing if, say, you work with your loved ones or really love the ones with whom you work. But is that fairly common? Not for most I’d say. Thinking later on the quality of my work-life and that of others, it occurred to me just how many salaried employees work through their lunches and breaks. I see it daily at my job across all levels of position, both hourly and salaried. My sister regularly pulls 50 to 70 hour work weeks on her salary, and still she works through her lunches and never takes breaks. It is hard to believe she is weighted with so many tasks that she must work 1.5 times a standard work week and still bypass her break times. When did being salaried mean doing the work of two or more people? That people are given such tremendous work loads they cannot manage to take breaks is unacceptable. Though their jobs promise breaks and offer lunches by law, those same jobs demand so much as to make taking them logistically impossible. Employees know every minute not spent working is another minute they are staying late and kept away from their lives. It is a common conception amongst many that once you start a salaried job – though you may be paid more than hourly waged jobs – you are worked up to twice as much. Companies that allow these workloads – unknowingly or not – are very much to blame. What choice do the workers have? They could take the breaks, go home “on time,” and not finish their work by the assigned deadline. But this behavior will likely land them in unemployment lines. The employees could bend the rules, skip some steps, and do some short cuts, but often that too will cause them to be fired or for customers to suffer. Employees could work hourly some place else, but those designations often signal lower wages and less secure employment. Companies promote wellness incentives (because it lowers their healthcare costs in the long run) and offer training in “time management” or other boosters to performance. But these seem superficial when the same employers are piling work on employees in unrealistic amounts (and when employees meet that expectation, the employer often expects even more the next time around). How can a worker take their break and go out for that “wellness walk” if s/he doesn’t have the time to leave his/her desk? Taking a break is effectively taking time from their families and homes. How can a worker possibly have any quality of life if they are given the work load of two full-time employees? Companies may say this is a cost-effective measure, that they had to cut waste. But what about changing their bottom line? What about changing the nature of corporate culture? Why not change the structure of the company so its employees are doing the work of one person each, and having an actual quality of life. This sounds like an excellent solution compared to the theoretical ones shared over email or by external consultants hired to figure out just why the company’s work force is so miserable and unhappy. Luckily there is are a slew of people and organizations interested in these types of issues. The Happiness Initiative is centered around the economics of happiness. What they and others (such as Edward Diener, Ph.D., the country of Bhutan, and a number of American cities and international countries) suggest is that countries base our economies not on the gross domestic product (which includes growth from negatives such as oil spills), but on the U.S. Genuine Progress Indicator or the Gross National Happiness index. These indexes focus on “psychological well-being, physical health, work/time balance, education and capacity building, cultural vitality and access to arts and culture, environmental quality and access to nature, apt governance and material well-being” (de Graaf, Sechrist source) as their measure for how successful an economy really is. In times like these, I cannot imagine a better way to judge progress and to judge our actions and governance. I urge you to read the article from which I quoted “The Economics of Happiness: The New Economy” by John de Graaf and Linda Sechrist. I also highly recommend taking the survey on The Happiness Initiative website. How happy are you? Find out there, and fuel their research! Tomorrow I will post my personal assessment based on tips to improve personal happiness. Perhaps you will see come things we have in common, or have your own modes of being happy that you would like to share! This entry was posted in Perspectives on Be Nice. and tagged Bhutan, happiness, quality of life, The Happiness Initiative by Jen. Bookmark the permalink. This is a great post! I was almost going to write “great article.” Extremely insightful Jen. I agree. Why is bottom line more important then the happiness of people? I know so many folks who are in this situation and they seem utterly miserable. This post is also PERFECT for the times. OWS is screaming at corporate structures to change! It just doesn’t cut it anymore. Pingback: More time for what matters | Be Nice.